Square Dish with Cover. 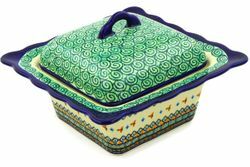 This Polish Pottery covered dish is ideal for serving - it holds the heat (or cold) longer because it's stoneware! This covered dish is beautifully decorated and makes a stunning centerpiece. Each stoneware dish is a unique creation by talented artisans from Boleslawiec, Poland. No matter what the occasion, quality handmade pottery is a gift that's sure to be treasured for years to come. With a lid you can bring favorite foods to a friend's house and they'll arrive ready to eat. Pop it in the oven for a few minutes to reheat.